Ducati.ms - The Ultimate Ducati Forum > Ducati Motorcycle Forums > Superbikes > 996 clutch question. 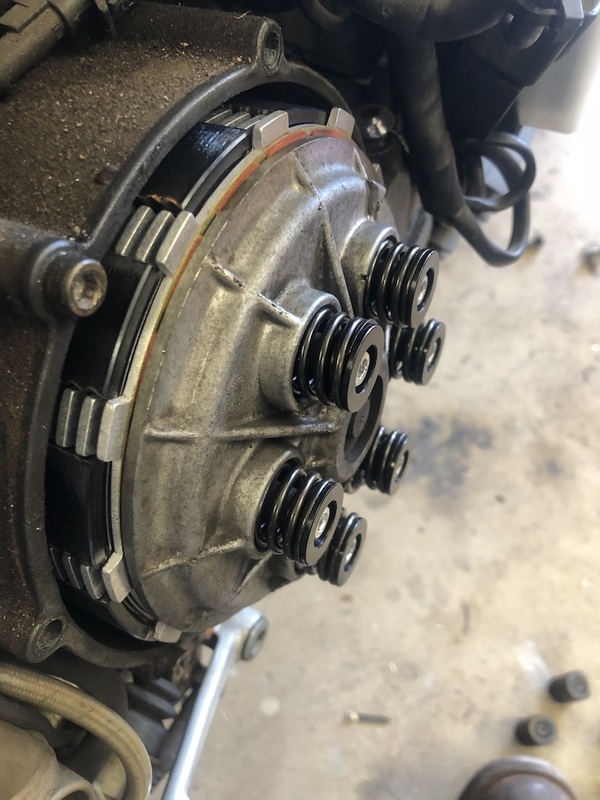 Just did the clutch on my 996, much needed. Barnett plates and kit, new pressure plate on the way and new springs/bolts. Assembled according to instructions, but I have one plate that isn't in the basket- too tall. Clutch engages and disengages like it should, no problem finding neutral, but this can't be right and I think I have one too many plates installed. Can anyone confirm? Does the Barnett kit ship with a different number of plates than needed, If I remember correctly the S and SPS has 1 more than the base '99 996? Definitely shouldn’t stick out of the basket! Did you bleed your clutch line? Ill bet you $2 that if you open the bleed screw it will drop down and push the rod back into the original position, “lowering” your stack. Last edited by draganc; Apr 11th, 2019 at 6:22 pm. One to many friction plates. If you use it it will slip out when the pressure plate is engaged and WILL jam the plate and stop your ride. Last edited by xracer; Apr 11th, 2019 at 2:43 am. while the sps did have 8 friction plates, it had a surflex sintered brass looking (or whatever it is) friction plate set, which also had thinner 1.5mm steel plates. i don't recall ever actually measuring the thickness of one, but from memory it's much the same as the organic 7 friction pack at 38.5mm. the 1098, etc, pack has 8 frictions and is about 41mm thick from memory. they also have a lot of 1.5mm steels, but are still thicker than the old surflex 8 friction pack. Definitely should stick out of the basket! Yep, bled when I did it, no change. One to many friction plates. If you did it it will slip our when the pressure plate is engaged and WILL jam the plate and stop your ride. Tried removing one of the plates, it seems to behave correctly with no slipping, and rattles like it should, keeping this for now, did hard pulls with no slippage, and shifting/neutural was fine. Interesting, I'll have to count the plates and do some measurement, Thanks! Better too low than too high. Acid test is does it slip, if it doesn't then you're good to go. Desmofreak and draganc like this. Agreed, too high and you won't find neutral at standstill. I set mine on the low side of the thickness spec and don't use dished plates and have never had any problems, getting hold of some 1.5mm plain plates gives more options when 'juggling' to the correct height.